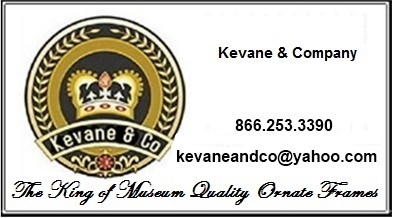 Kevane & Company - Ornate Picture Frames, Museum Quality Picture Frames, Custom Picture Frames - from Museum Quality Framing to Ornate Corner Custom Size Frames. Gold, Black & Gold, Silver and all finishes avaiable. Welcome To Our Beautiful Shoppe! Thank you so much for taking the time to visit our online shop. We are an online only business. 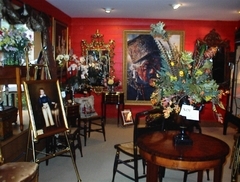 Kevane and Company started as a small, boutique antique shoppe in New Hope, Bucks County, Pennsylvania many years ago. As we opened our doors we also launched a small little website to go along with our opening. Well, the rest is history! In short order the website grew to overwhelm our entire business. It turns out that the country was thirsty for the ornate picture frames that we were able to source from around the world. Please view our entire award winning collection here. Kevane & Company is now World Famous for our Picture Frames and Ornate Mirrors - many of which have found a place in some of the worlds' finest homes and are featured in many major Motion Pictures and an large number of Television pilots and productions. We are the world's leader in english metric ornate framing. If you have a tough framing problem please email us at once or give us a call. You will not be sorry. Please check back frequently as we are constantly adding new merchandise. Our mission is to offer the general public the most fabulous and unique furniture, home accessories and home furnishings usually only available to, or through, interior decorators or interior designers. Everything you see on our pages is of the finest quality and best workmanship available. Our philosophy is that high design and luxurious style should not be confined to a few metropolitan areas and accessible by only an elite few. We offer only the best and most beautiful items available for your home ~ large selections from difficult-to-find exclusive lines such as Jeanne Reed's, and Bougainvillea Dried Flowers! We invite you to visit us here on the web, call us at the number above, or e-mail kevaneandco@yahoo.com with any questions or comments you may have. Happy shopping! We are an online business and do not have a physical shop that is open to the public for retail shopping. But if you would like to email or call us we will be happy to discuss any of our products and finishes with you. What ever you do, don't miss our spectacular page of special Savings and Discounts! 40% Off our new Manhattan Gallery Series of Picture Frames and High Gloss Ornate Baroque Mirrors, these are truly gallery level productions at an exceptional price! On Sale 40% Off from Now until Friday April 19, 2019! 50% Off - Introducing our Newest Two Lines of Ornate Picture Frames - the Series 1000 and our the Series 1200 - as an introduction all Series 1000 picture frames and Series 1200 picture frames are on sale 50% Off from now until Friday April 19, 2019! 45% Off until Friday April 19, 2019! - All of our Fabulous Wall Picture Frames! This is our extraordinary collection of Picture Frames. We have also organized the collection into the following subsections: Ornate Picture Frames, Large Picture Frames, Picture Frames by Size. Our Entire Picture Frames Collection is on Sale NOW 45% Off! 35% Off - Our New Line of Copperglass - Real Copper, Copper Clad Planters & Urns! 15% Off - Our Selection of Luxury - Lamps - On Sale NOW! We are very proud of this NEW line of Lamps and Lighting! 25% Off - All Bougainvillea Dried & Preserved Flowers and Trees. Super upscale and chic, Bougainvillea Dried Florals are extremely hard to find! For our picture frames layed out in a more user fiendly fashion, please visit Ornate Picture Frames. Or our other website focusing of our Museum Quality Ornate Picture Frames.